For over 30 years, Dawn Ellmore have specialised in legal and intellectual property recruitment. 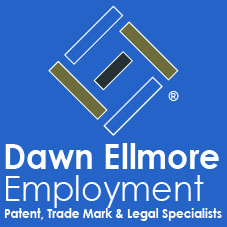 Dawn Ellmore Employment is a market leading legal and intellectual property recruitment agency. We have been providing a professional and high-quality recruitment service to both clients and candidates since our inception in 1995. At Dawn Ellmore Employment we have over 30 years of experience recruiting exclusively for the legal and intellectual property industry in the UK, Europe and overseas. We take the time to form strong relationships, allowing us to understand your specific needs and deliver effective solutions for both clients and candidates. Our personalised approach has contributed to our long standing success in the legal and intellectual property field and made us the go-to recruitment provider for many private practice attorney firms and in-house company departments. The exceptional quality of our recruitment service ensures that our clients and candidates return to us time and time again. Dawn Ellmore Employment is a member of, and is regulated by, the Recruitment and Employment Confederation (REC).